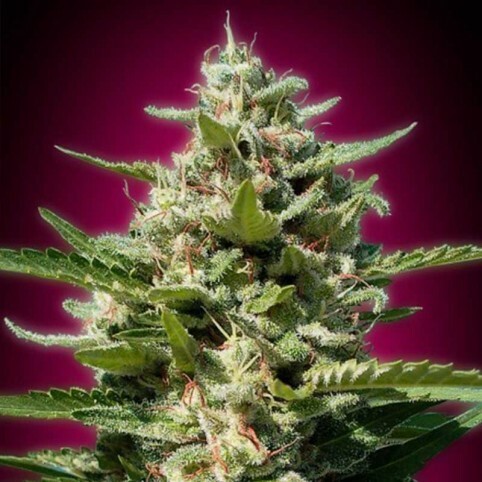 White Kush cannabis seeds are an almost pure Indica. It's strong, pungent aroma and distinct bud formation make it a real party for the senses. White Kush is stunning in terms of taste, sight, smell and effect, traits that come straight from its Indica-dominant background. White Kush is a potent nighttime smoke; its deeply relaxing effects are ideal for the treatment of insomnia, and users report feeling happy, sleepy and chilled out. Flowering in roughly 8-10 weeks, this strain is good for both indoor and outdoor setups. Its dense, thick buds grow with very few leaves. White Kush has a strong aroma and a varied and complex range of flavors. It's sticky flowers impart earthy, pungent flavors with sweet undertones. This strain is easy-to-grow and a model strain for Indica lovers. Royal Medic is a new feminized hybrid of two great cannabis strains from Spain. Its genetics are a c.. Elegant and refined - like a lavish trip to a cosmopolitan city - this strain of marijuana is the to.. Peculiar for its strong growth, this strain comes from Black Widow and White Widow.It’s a Sativa wit..